It's a strange API, that. As soon as you set a property (src), it does something. It sends a request. Weird. Oh well, it is what it is. TypeError: 'set src' called on an object that does not implement interface HTMLImageElement. Now, how about that magic in the middle? Finally, returning a Proxy instance that passes all there is to pass through the handler and onto the native Image instance. As you can see, all you need to do is check when src is being set and log it or do whatever with it. Interception complete! Can you tell the fake? Don't think so. 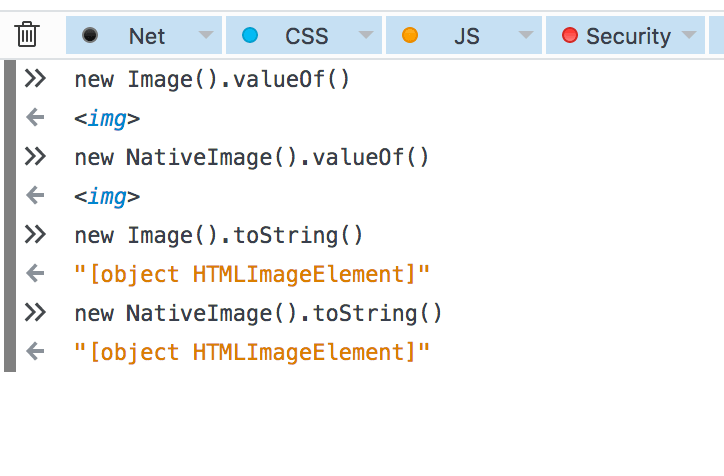 Did you notice the NativeImage.toSource() call? Instead of hardcoding the [native code] mumbo-jumbo string, just ask the original. Especially given that browsers vary in the exact output. What about toString() on instances? What about valueOf()? Oh crap! No one must see them proxies and objects. Recall the ole Object.prototype.toString.call call, y'all? People have used it since forever to tell, for example, real arrays from array-like things, such as arguments and NodeLists. (That was in the olden days before Array.isArray()). Still very useful to tell, e.g. native JSON support vs a polyfill. How does our little Image "polyfill" behave? Poop! We're caught in the act. There's a fix. Wait for it. Symbol.toStringTag. Yup, that's right. No one checks the prototypes of the potentially useful things, but, hey, we're overachieving here. Again, not hardcoding a string, but giving the browser-dependent different output, piggybacking on the native Image. Fake it till you make it. Result to play with. Our fake is still recognizable in the browser console (like console.log(new Image())) but your victim (unsuspecting logging-reporting-ads-analytics script) is code. It doesn't look at the console. An Object.prototype.toString.call() is usually the extend of all checks for nativeness. If that.